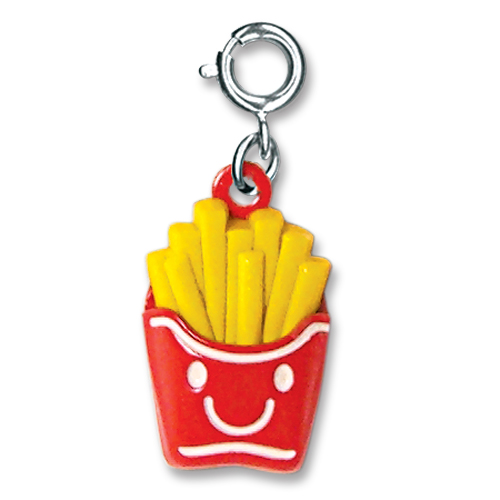 Always have a side a fries handy with this cute little CHARM IT! french fries charm served with a smile. With a simple snap of a clasp, girls can personalize their CHARM IT! jewelry with this adorable CHARM IT! french fries charm. Encourage healthy habits with this adorable CHARM IT! Red Apple charm. You scream, I scream, we all scream for CHARM IT! ice cream cone charms. Enjoy the classic goodness of an ice cream sandwich with no worries about cavities with our fun CHARM IT! Ice Cream Sandwich Charm. This fun 3-dimensional CHARM IT! Popcorn charm has an added treat... sparkly pink acrylic stones for just the right amount of bling. This super cute CHARM IT! Smores Charm has melting "chocolate" dripping down the sweet marshmallow's face.